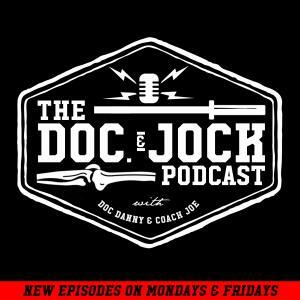 On Episode 188 of the Doc and Jock Podcast Coach Joe catches up with Zach Long (The Barbell Physio) to talk about his new Mobility & Technique for Olympic Weightlifting program that he created with Olympic Weightlifter Jared Fleming. If you aren't familiar with Zach he's one of the best Physical Therapist in the United States. At his practice in North Carolina he works with everyone from Carolina Panther's to kids soccer teams. Post Comments about this episode, potential topics, suggestions for interviews and questions to the Doc and Jock Website, facebook page, and twitter account. Also be sure to reach out to Dr. Danny and Coach Joe at their personal social media accounts listed below in the show sponsor section. Also, please check out these links to the articles and content creators mentioned during our conversation. Doc and Jock would like to thank official Show Sponsor Mobility WOD for their support. Please gang head over to www.mobilitywod.com for all you mobility needs where you will find the latest MWOD products, episodes, upcoming seminars, daily MWODS, help finding a provider and the subscription services Mobility WOD Pro. Mobility WOD PRO is a perfect resource for any coach looking to up their positional knowledge base and infect their community with true suppleness! Performa Sleep has developed what they believe to be the perfect mattress for athletes. Their athlete – specific sleep technology is a three layer mattress designed to ease muscle tension, boost recovery, and sooth hard working bodies. Head over to their webpage to read learn more about their CopperCool technology and to read testimonials from our very own Dr. Danny, and CrossFit Games Athletes Scott Panchik (@ScottPanchik), Emily Bridgers (EmilyBridgers), and Lauren Fisher (LaurenFisher). Exclusive to the Doc and Jock audience, Performa Sleep is providing a discount code to receive $75.00 of the purchase of any size mattress. Simply head over to www.performasleep and enter the code JOCK75 at check out. Along with $75.00 off Performa Sleep already offers a 90 day money back guarantee and free shipping. Dr. Danny offers an assortment of services. If you are in the Atlanta area be sure to look him up. If you are not in Atlanta please be sure to shoot him an email or follow him on the social sites listed below. Coach Joe offers a variety of live and online training options including a private facebook group titled #HeelsOff where you can get his honest and FREE opinion on your movement and unfiltered take on Weightlifing. Join the conversation at any of the links below.